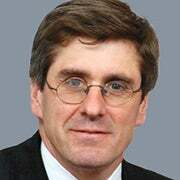 Stephen Moore, who formerly wrote on the economy and public policy for The Wall Street Journal, is a distinguished visiting fellow for the Project for Economic Growth at The Heritage Foundation. He was also a senior economic advisor to Donald Trump during the 2016 presidential campaign. Read his research. Take a wild guess what country is reducing its greenhouse gas emissions the most? Canada? Britain? France? India? Germany? Japan? No, no, no, no, no, and no. The answer to that question is the United States of America. Wow! How can that be? This must be a misprint. Fake news. America never signed the Kyoto Protocol some two decades ago. We never enacted a carbon tax. We don’t have a cap-and-trade carbon emission program. That environmental villain Donald Trump pulled America out of the Paris climate accord that was signed by almost the entire rest of the civilized world. Yet the latest world climate report from the BP Statistical Review of World Energy finds that in 2017, America reduced its carbon emissions by 0.5 percent, the most of all major countries. That’s especially impressive given that our economy grew by nearly 3 percent—so we had more growth and less pollution—the best of all worlds. The major reason for the reduced pollution levels is the shale oil and gas revolution that is transitioning the world to cheap and clean natural gas for electric power generation. For every ton of reduced pollution the United States emits, China and India produce almost 10 more tons. This means it doesn’t really matter how much America reduces its greenhouse gases because China and India cancel out any and all progress we make. Those who think they are helping save the planet by purchasing an electric car, or putting a solar panel on their roof, or trying to shut down coal production in the United States are barking up the wrong tree. If we want to stop greenhouse gases, there is no way to make progress without China and India on board—which they clearly are not. This latest data also demonstrates that despite all of the criticism across the globe and in the American media, Trump was completely right to pull the United States out of the flawed Paris accord. That might be one of the most universally violated treaties of all time—which is saying a lot. 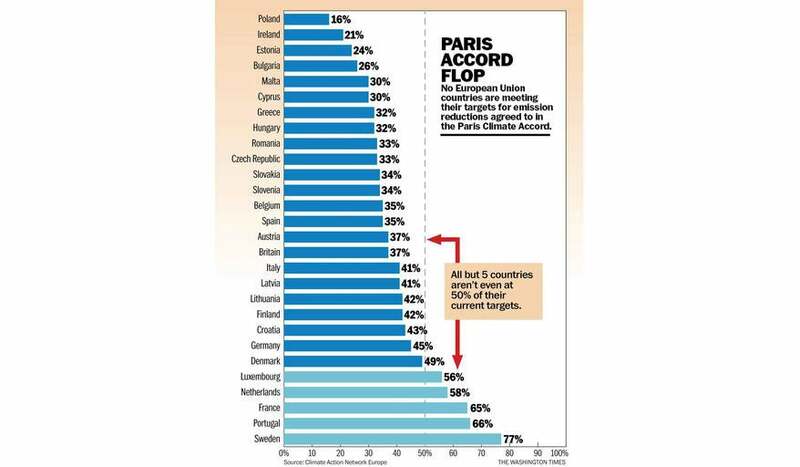 The chart below shows that nearly every nation that signed on to the Paris accord and has admonished America for not getting in has already broken its promises. 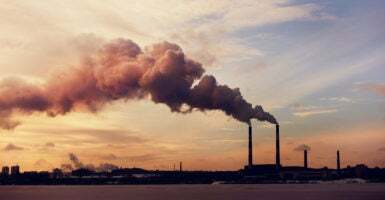 Not a single EU nation is within 80 percent of its respective target for emission reduction, according to Climate Action Network Europe. In its official EU report, Climate Action Network Europe said, “All EU countries are failing to increase their climate action in line with the Paris Agreement goal.” All but five countries aren’t even at 50 percent of their current targets. So there you have it. The countries in the Paris climate agreement have broken every promise they’ve made and the nation that hasn’t signed the treaty is doing more than any other nation to reduce global warming. Yet, we are being lectured by the sanctimonious Europeans and Asians for not doing our fair share to save the planet. It’s another case study in how the left cares far more about good intentions than actual results. What matters is that you say that you will wash the dishes, not that you actually do it.